From the Hancock County Courthouse, go southwest on Hwy 22 for 7.2 miles to Devereux. Turn right (at the backwards fork) onto Main Street. Go 0.2 mile to the dead end and turn left on Jones Chapel / Devereux Rd. Go approximately 2 miles to Powell Grove road on your right. Go on Powell Grove Rd. for 1.4 miles to the end of the pavement and the intersection of Powell Grove, Sandy Run Rd and King Rd. Take Sandy Run Rd which is straight ahead. Follow Sandy Run for 1.5 miles to where it splits. Turn left (onto Road number 148) at the split. Go 0.3 mile to a logging road on the left. Follow (walk) the logging road for 0.8 mile to the cemetery, which will be on the right side of the logging road. The cemetery is on a ridge which looks down on Island Creek to its south. A GPS system is recommended. 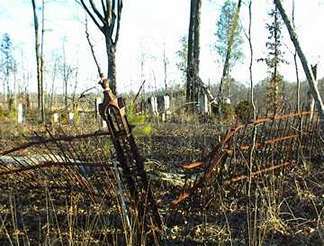 Currently extensive logging has occurred all around the cemetery. 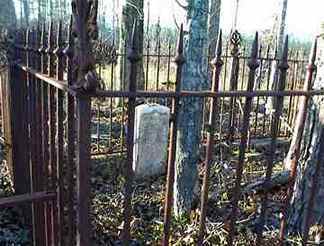 The cemetery sits within an iron fence within some trees on the ridge. The cemetery is on a hill just beyond a hill with the Butts-Simmons Families Cemetery. Stone broken at death year. Death year per Kimbrough list. s/o T. J. and E. A. Jones. A child-sized grave with no last name nor dates. "Only sleeping" d/o T. H. and E. B. Coleman. "Father" On same stone as Ellen Butts Coleman. "Mother" No death date. On same stone as Thomas H. Coleman. Cap. Baldwin Blues Co. H.
Corp., Co. E, 7th Ga. Cav. No last name nor dates.